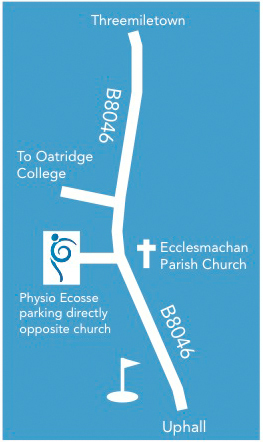 Operating from purpose built facilities with on-site parking, Physio Ecosse is conveniently located in the heart of rural West Lothian. Our entrance is directly opposite the parish church in Ecclesmachan. If you are coming up from Uphall, we are on the left just after the sign for Binny Plants and the cemetery (and just before the turn to Oatridge College). If you are coming down from Threemiletown, we are on the right just after the turn for Oatridge college and before the cemetery and Binny Plants. Turn in to the car park and park in front of the clinic building. Press the buzzer at the front door and we will let you in!